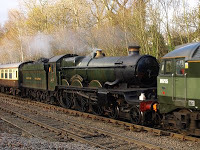 EX-GWR steam loco 5029 Nunney Castle had operating problems during a previous weeks railtour and was left at Shrewsbury. 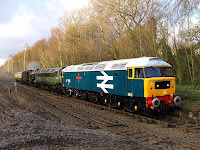 Class 47s 47580 "County of Essex" and 47773 were sent to Shrewsbury to drag the lightly steaming engine back to Tyseley. 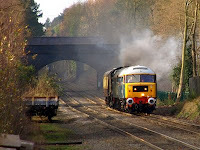 Here the convoy passes Sutton Park running a few minutes early, on Thursday 4th December 2008. Very nice! That 47 looks superb passing the flowerbed wagons..